When planning a sweet table, the goal is to enhance the theme of your wedding, not detract from it. For example, if you are having a very sleek and minimalist wedding in muted tones, you don’t want to have a lavish and brightly colored table dripping with candy necklaces and giant lollipops. If your wedding theme doesn’t fit the traditionally nostalgic sweet table, try a monochromatic presentation in white or one of your wedding colors. Before you determine how many candies and pastries to buy for your sweet table, first decide what you want the layout to be. The goal should be a fairly symmetrical design. I love the look of glass jars in varying sizes and shapes. 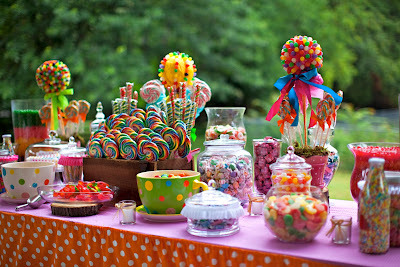 Remember, sweet tables are not necessarily a buffet for guests. You shouldn’t think in terms of how much each person will enjoy, but rather what will maximize your presentation. Above all, this is a chance to incorporate an extra dash of fun to your wedding reception. Truly delicious sweet tables! Need to have one for my niece wedding reception party at one of magnificent San Francisco wedding venues. This is something new and will attract people. Quite sure that everyone will love it.